Pippa (1 year, female) was supposed to be desexed yesterday. 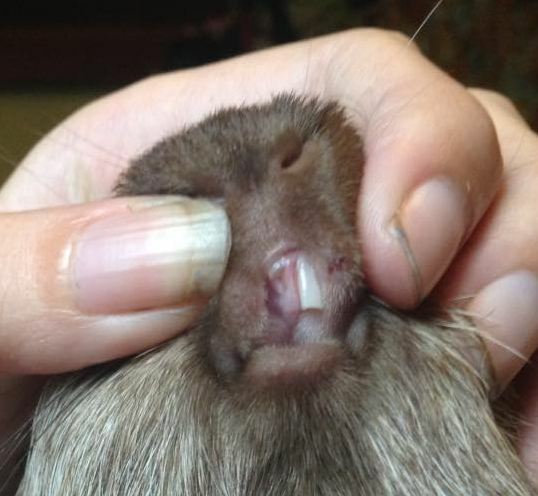 She had reflux under anaesthetic so the procedure was called off, but while she was out the vet noticed that one of her incisors had cracked right through. She trimmed it right down to the crack. The tooth will grow back and her desex has been rebooked for next month so everything can be checked again under anaesthetic at that point, but until then she essentially has a missing front tooth. I was given no advice about how to deal with this. Aside from keeping an eye on the growth of the lower tooth, I'm concerned about her eating. I have her on my chest right now with a strawberry and she's barely touched it. How do I make sure she's getting enough food until she can eat normally again? Pictures below with tooth and still-intact strawberry. Aw, she is a cutie! Would you like me to add your pics permanently to your thread for future readers? Read over www.guinealynx.info/teeth_broken.html for help handling this and to tell you what to expect and how long it will take the tooth to grow out. You might want to start weighing her daily right now as a double check that she is eating enough. I changed the title of this thread so it can be Pippa's medical thread. I'm happy for images to be embedded. I went in to the vet to buy critical care (meal replacement formula) and the vet who did the surgery was there and she was surprised it's affecting Pippa's eating at all. I'm not 100% sure about her advice in general though - we have a history. The timeline on that page actually looks about perfect for her rebooked surgery, so hopefully I only need to get her top tooth trimmed a couple of times. If you read the broken tooth page thoroughly, the other tooth may wear normally without extra trimming. Be prepared to fight to not have things trimmed too short. I hope there are no further complications with the teeth. And thanks for the pics. I'll go add cropped versions (load quicker). p.s. If you'd like to add weekly pictures to show how the tooth is growing out, that would be great! She broke her other top tooth. fml. Looking into Vit C. Gunna have to take her back to the vet to figure out if that's the problem and why she's not getting enough. 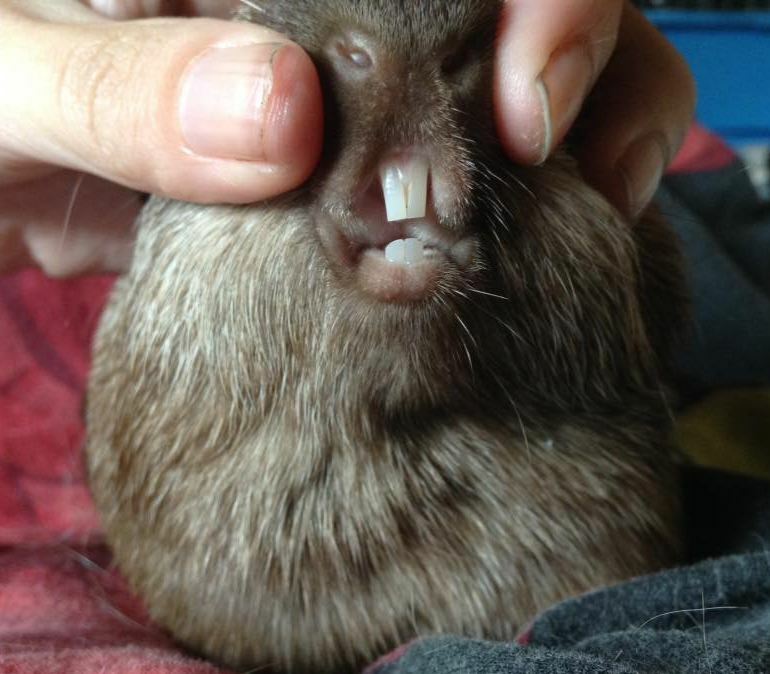 And yeah I'm hoping her teeth won't need trimming, but I'm not sure how far below the gum the first tooth is broken. I think it's starting to be visible, so hopefully her teeth will meet before the lower ones start causing problems. If she is otherwise healthy and receiving a good standard diet, it may be she damaged her teeth in a fall or from pulling on cage bars. It is quite likely they will grow back okay. Your primary issue is to make sure she is eating enough until the time the incisors are long enough to eat normally. So weigh daily and try some of the food tips on the broken teeth page along with hand feeding as necessary. Ditto Lynx. It's far more likely that she broke them chewing the bars than because of a vitamin C deficiency. Yes. Quite unlikely caused by a vitamin C deficiency if you are feeding properly. My concern was more about her competing for food and getting enough. She's the bottom of the pecking order. We've had one hell of a drought and fresh forage just hasn't been available over summer. My entire veggie garden died too, so financially it's been difficult to get them as much fresh food as they're used to. I've been feeding her out of my hand now to make sure she gets some. Her teeth are growing back really fast... photo when I can get it off my phone. ....... this pig is a trouble magnet. Just pulled two grass seeds out of her eye. Unsire if she has any damage... need to wait and see how it's looking later tonight. 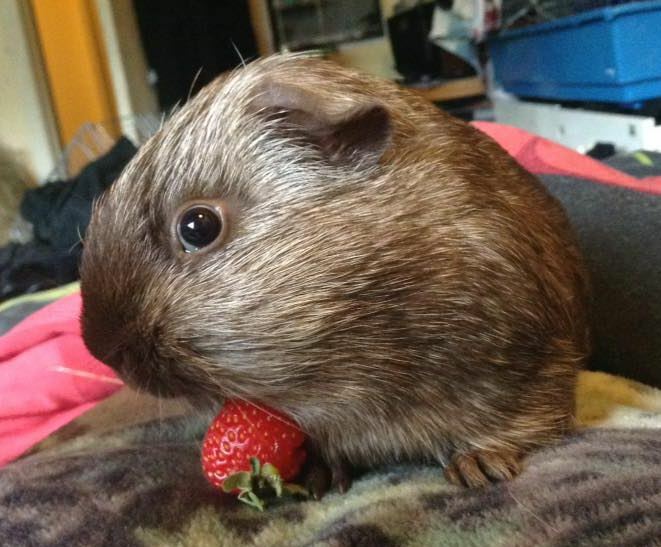 Can you use human eyedrops on guineas? I have saline as well, but only in huge containers. What kind of human eye drops? You can flush with sterile saline if you wish. I'll still be keeping an eye on her teeth for the next few days, but given that the top two are the same length now it looks like they're meeting and wearing down just fine. 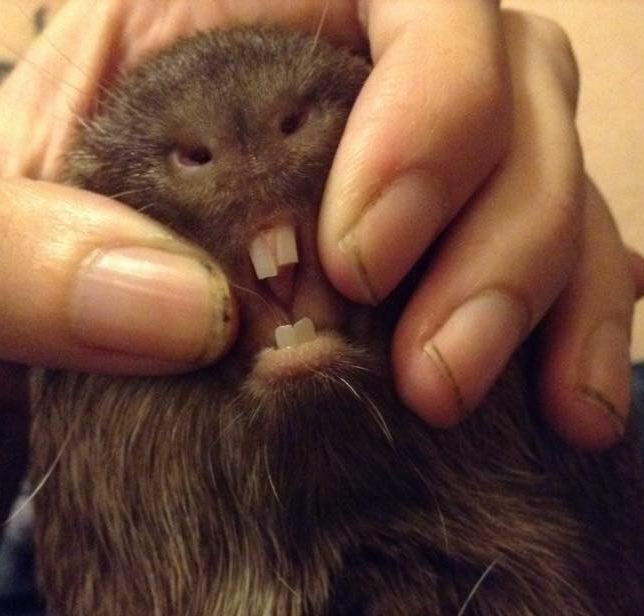 The teeth look even better now!